A student-moderated dialogue held last Thursday on conflict resolution between Israel and Palestine featured University of California, Santa Barbara Professors Salim Yaqub and Mark Juergensmeyer, as well as Daniel Wehreinfennig, UC Irvine professor and executive director of the Olive Tree Initiative. 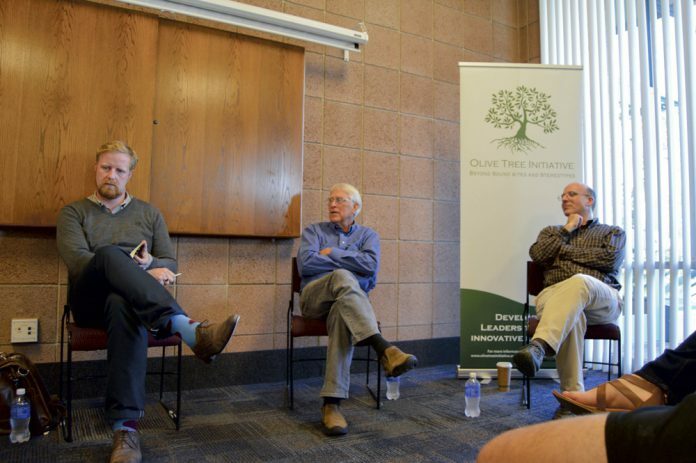 UCSB’s chapter of the Olive Tree Initiative — a university-based organization that educates students on conflict analysis — hosted the May 12 panel in the University Center Mission Room. Discussion centered mainly around whether the Israel-Palestine conflict should still matter to the people of the United States and what future role American foreign policy should have in the matter. The panel also touched upon the roots of the conflict and how problems between Israel and Palestine have affected the overall dynamics of the Middle East for better and for worse over the past 50 years. Several questions were dedicated to the Boycott, Divest and Sanction (BDS) movement at UCSB and its overall effectiveness. Wehreinfennig also made a point to recognize that higher-priority problems in the Middle East — such as the Syrian crisis — may actually buy the U.S. time for “policy review and re-evaluating our strategy” in Israel, while it deals with those more pressing issues. When the conversation shifted to how the United States should act moving forward, each professor had a unique view on the situation. Meanwhile, Juergensmeyer discussed some potential solutions to the conflict that have previously been explored, including a single-state solution, multi-state solution or even a confederacy between Israel and Palestine. He made the point that both parties “have to have a will to want to move there” if there is to be any resolution, whatever that ultimately entails. Juergensmeyer also suggested that since the U.S. has so far been unable to broker a peace deal between the two nations, other countries such as Saudi Arabia might step up in a third-party role. Wehreinfennig pointed to German and French history to demonstrate how division can sometimes be the best route to reconciliation between opposing groups. While certain subgroups within the greater Israel-Palestine conflict have shown some ability to get along, Wehreinfennig suggested that a two-state solution might help taper down hostilities for a larger portion of both populations. Both Juergensmeyer and Wehreinfennig asserted that it will take support from the Israeli government and a population with a shared vision to make any solution work. With regard to BDS organizing at UCSB, all three panelists were relatively pessimistic about the movement’s effectiveness and believed it to be less valuable than it once was, though they sympathized with the BDS goal of using nonviolent measures to bring an end to hostilities between Israel and Palestine. Groups affiliated with the BDS movement at UCSB have previously called for the UC to divest completely from companies that allegedly stand to profit from Israel’s military presence in Palestine — including Raytheon, Caterpillar and Northrop Grumman. Student governments on seven other UC campuses have already passed resolutions in support of divestment. Juergensmeyer perhaps best summarized the panel’s thoughts, many of which were concerned with the focus of the BDS movement on campus. “A concern about any form of a protest movement [is] that it be articulate and targeted to what is specifically the issue of concern,” he said.